Now you can access www.manupatra.com anytime you need it. 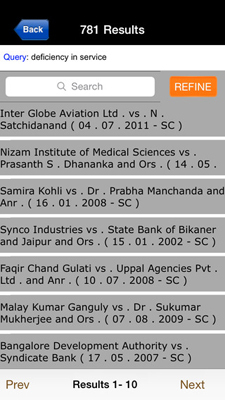 Manupatra for the iPhone/iPad is a legal research resource which gives you instant access to an entire set of Indian Case laws and Acts and allows you to search the comprehensive library. Whether you're doing research during your commute, in court, during argument to check your opponent's case or working at an off-site client meeting, Manupatra for the iPhone/iPad puts the most comprehensive collection of legal information right at your fingertips.